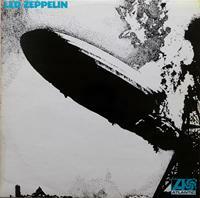 The legendary first album by equally legendary band, Led Zeppelin helped lay down the foundations for heavy metal. Recorded without a contract and with just 36 hours of studio-time I got to say it's money well spent and pound for pound it could be one of the heavier albums. Compared with their fourth, released just two years later, this is more of straight on rock, no frills, no silly excursions into pseudo-folk or anything like that. With most of the material taken from their brief stint as The New Yardbirds due to contractual tour-obligations (half of the tour was in Sweden by the way - mini-shout out!) it's not perhaps the defining Led Zep alum, but it gives insights into the future of the band as the tracks credited to the whole band are in general a bit better than the ones they covered or solo-wrote. Especially the two-minute-thirty-second Communications Breakdown and the six minutes longer How Many More Times together with the first track, Good Times Bad Times. Sadly, the latter feels like it gets cut short when the fade-out starts, cause y'know - Robert's still singing full force, so why fade?